What is the best shoe dryer? It is important that the device could dry not only shoes but also hats and glove since the rain is indiscriminate. These are mostly stationary models and are more powerful than portable ones. The unit should have various temperature settings so that you could choose between cold and hot air drying. A good model should make your shoes dry within an hour or so and can be heated to a temperature of up to 105 degrees Fahrenheit. We believe that Advantage 4-Shoe Electric Express Shoe and Boot Dryer fits these criteria best. Why have we chosen this model? It handles all types of material, including leather, synthetics, rubber, and canvas. Not only does the device dry the item, but it also removes odor and prevents mold. The dryer can be heated up to 105°F and does the whole job within at most 2 hours. To show its confidence in the quality, the manufacturer offers a 2-year warranty for the product. Everybody will agree that wet shoes are not the most pleasant thing. How do you avoid damaging your expensive shoes or boots? The best decision is to buy a dryer. There are various models for boots or waders that are multifunctional and portable. There are even propane dryers for hunters and fishers, as well as special UV-sterilizers for people with sweaty feet. The device itself is pretty new, but one can find more than 1700 options. 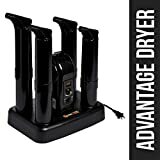 Thus what is the best boot dryer on the market? 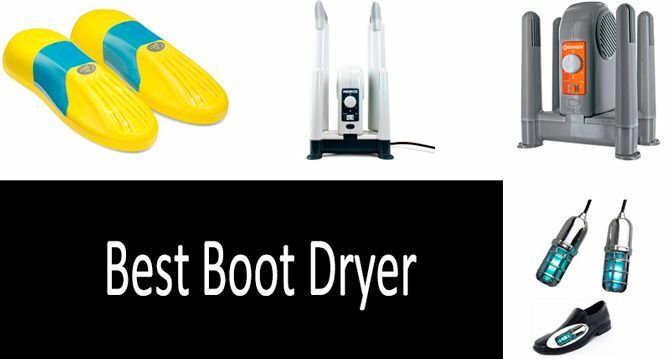 In order to make the selection process easier for you, we have found the eight best boot dryers with prices ranging from $16 to $80. Stationary dryers – devices which can be used to dry not only a pair of your boots or shoes, but even a pair of gloves or a hat. Portable boot dryers, which won’t take a lot of space and can even be used during the rainiest of journeys. How to choose a shoe and boot dryer? Even now, one can notice that there are two main types of such dryers on the market – they have different forms, but both types use the same principle of operation, i.e. a dryer directs hot air flow, which is then used to ventilate and make your shoes dry. Stationary “drying stations”. Such devices usually have four pipes, two for shoes and two for gloves or hats. This type of device has a lot of different functions and supports various changeable caps: for helmets, hats or baby shoes. It requires some space for installation, even though it doesn’t require a lot. In the majority of cases, such dryers support variable temperature selection that allows users to choose cold or hot air drying with temperatures reaching 105 degrees. For an expensive pair of leather shoes, one has to select the cool air mode. The drying process will take up to six hours instead of one or two, but your precious shoes won’t be damaged. In case you are a big fan of fishing or hunting and it’s simply impossible to “kill” your boots, select the highest temperature. Some devices are equipped with timers in order to make the drying process more convenient. Bigger models usually have a special “heat/no heat” switch, which makes it possible to enable and disable the heating module. It’s worth noting that all heating parameters are calculated by manufacturers for hot air flow. The cool air heating process requires significantly more time. Portable boot dryers. These devices also require power connection, but they have less functions. The drying process takes around 3-4 hours with temperature around 80-90 degrees and users won’t find a huge variety of different working modes. The main advantage of such devices is their size and portability, which allows you to take them with you anytime. In this section, we are going to discuss fully functional drying stations for home use. Such devices are powerful, have a lot of settings, and can be used to dry not only your shoes, but also hats and gloves. We have selected the eight best models. Some of them are created for boots or ankle boots, while others are made for waders. We have even included propane dryers and special UV-sterilizers for shoes in this list. The majority of powerful dryers support temperatures of up to 105 degrees and a cool air drying mode (you can choose the most appropriate mode). Less powerful models can give twice lower temperatures, while sterilizers make no heat, and will only help with hyperhidrosis and fungus. Drying time is also different, it’s around one hour for more powerful devices, and 6-8 hours for cheaper models. Several manufacturers are competing for the name of the best seller: Peet Dryer, MaxxDry, DryGuy. Each of these brands has several different models. Various models are called “best-selling” every day. We have selected the best models for various needs. ✔ Eliminates moisture, prevents mold and mildew, and preserves your gear. ✔ Dry two pairs of shoes at once or attach PEET Helmet or Glove DryPorts (sold separately) to dry it all. If you are living with a couple of your friends, then one pair of pipes may be not enough for you. Especially for such cases, manufacturers have created more “heavy” models. A powerful dryer with 4 pipes requires around one or two hours to make your shoes totally dry. It supports temperature around 105 degrees (F) in the heating mode. When standing near it you can feel the heat wave, so you there’ll be no issues about the power level of this device. It also supports the cool air drying mode, but it can’t be compared with the heating mode. You can dry your gloves, but special caps have to be purchased separately. This model has a timer that has all features of the top models and can be set up incredibly fast. Only the price of this device may scare you, because it’s the highest one in our list. But if you prefer quality, without looking at price, we really recommend you buy this model. «Easy to assemble, easy to operate and sturdy enough. And i can't believe how quickly it dries out shoes, boots, and gloves. No more hanging these in front of a fan or placing them over a vent and waiting an eternity for them to dry». «This has done wonders for getting rid of foot stink of shoes and boots. It is fan driven, so it is a little bit noisy, and it moves a fair amount of air. When the heat setting is selected, the air that comes out is warm, not hot, so it should be safe for any shoe or boot I would imagine». A powerful model, which is no worse than the best-selling one, and supports various knee and over-the-knee shoes. Guys from DryGuy were able to fulfill even such demands. We have a basic model with 4 pipes and two additional long caps. It also supports temperatures of 105 degrees (F) in the heating mode, which is more than enough to dry your shoes in a couple of hours. Long pipes are super useful, because they have better air circulation and can ventilate your shoes much better. This model has a higher price, but its additional functionality is definitely worth noting. «Super happy with this dryer. Temperature is limited to prevent damage to leather or synthetic fabrics and preventing damage to the heater itself. My only complaint is the dial is a bit difficult to turn. The 4 posts can accommodate two pairs of boots or gloves, even a helmet». «Not as quiet as it is stated to be, but has worked great. The heat does not seem to be evenly distributed though between the four vents, as the two fronts seem to have more than the rear ones. The timer dial is really stiff and difficult to turn, but it does a fairly good job of drying my gloves. I haven't actually timed it, but it probably takes about an hour». DryGuy DX: Check the current price. A nice dryer with great functionality can’t have only one working mode or function, and all manufacturers are aware of this fact. The model from MaxxDry is able to dry not only a pair of shoes, but also a pair of gloves at the same time. How long does it take for such a device to remove all the moisture from a pair of shoes? If we are talking about walking in the rain and not diving in the sea, it will take only an hour. This device supports the maximum temperature of 105 degrees F. Users are not allowed to change the working mode of the device, but it has a special timer, which can be used for more difficult cases when one hour of drying is not enough. You can set the timer and go and do to bed. In the morning, you will have a pair of dry and clean shoes. This model is great for low or ankle shoes, because it’s not powerful enough to dry over-the-knee models. For such cases, one can use different models with adjustable pipe height. If you don’t plan to dry gloves, you can buy another simple model from PEET - Original 2-Shoe Electric Dryer. Some boots (especially winter models) have a pretty high level and it’s impossible to use a simple dryer to make them totally dry. For such cases, you can use special models with higher pipes. The main difference with the previous model is that air flows through the entire pipe of this device. In other words, air is circulating all around the boot. This device is also equipped with a special container for water that comes from your boots, which is a very useful feature mentioned in more than 600 customer reviews. One of the main disadvantages of this device is its drying time. Users mention 6-8 hours for only one pair of shoes. This device is pretty “dumb”, because it doesn’t have a timer or various working temperatures. It also doesn’t have any additional pipes for gloves. 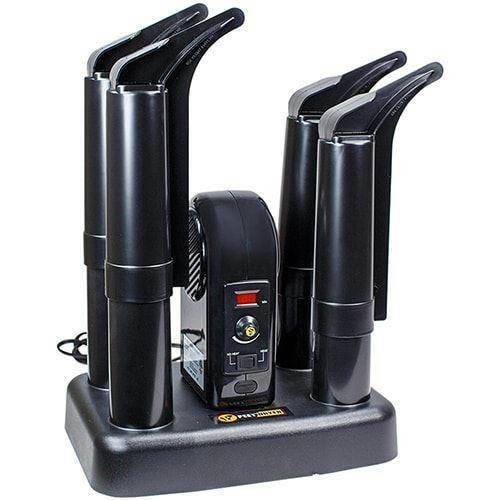 However, it has an attractive price, thus, if you are not in a hurry and 6-8 hours is OK for you, take a closer look at this shoe dryer. It’s usually pretty difficult to dry totally wet boots, because water starts to flow out immediately when we place our shoes on a dryer. This is a headache because you have to remove water from the floor. This model has a special container that will collect all the moisture and water, avoiding stains on the floor. 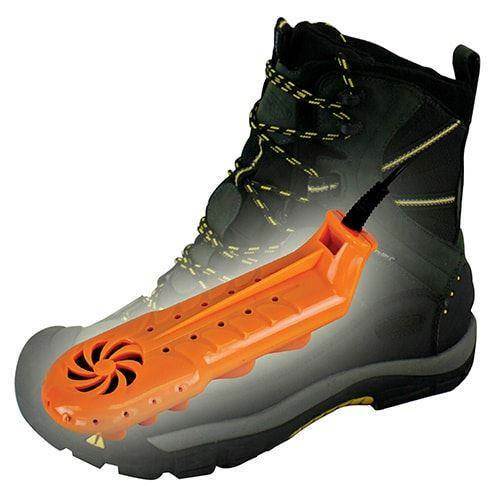 This device is equipped with fully ventilated long pipes, which totally remove any odor from your boots. One of the main disadvantages is the working time of device. According to the manufacturer this model requires 6-8 hours, which is pretty long. But if you want to save some money, and time is not a key factor for you, you will definitely love this model. We recommend you read all customer reviews in order to know more about this dryer. Pretty small portable dryers in a form of your boot don’t require a lot of space and can be easily out into your luggage. Such models are not as powerful as stationary ones, thus there are not many models in the market. We are talking about portable gadgets now, thus we can ask for some compatibility. This model has it all – it can be used at home, as well as in your car by using a special connector. The main characteristics of this model are pretty impressive for a portable device: a working temperature of 99 degrees is enough to dry a pair of boots in 2-5 hours. Even though this dryer has a fixed form and size, it can be used even for a bigger pair of boots. It involves the same principle as other stationary devices and uses air flow. You don’t need to worry about air circulation, because it gives the very same effect as other full-sized products. It’s a real jewel for travel lovers. In case you don’t like camping or walking in the rain, this dryer will perfectly fit your shoe shelf, because it has a very small size. Even though the previous model has great functionality and a compact size, you’ll be disappointed with the lack of different sizes, because the majority of such devices can’t be used to dry kid's shoes. 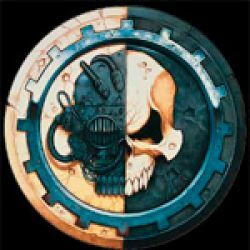 However, this aspect was taken into account by another manufacturer. We are offering you a range of dryers with sizes from 3 to 13. The size of the device is equal to the shoe size, but remember that you can use the dryer of the 10th size to dry shoes of the 13th size, but not vice versa. This device requires 3-4 hours to dry your shoes, and this time significantly decreases for kid's shoes. Unfortunately, this model can’t be used in your car, because it doesn’t have any adapter. The price is pretty low, so you can buy several dryers for all members of your family. We managed to find a full size boot dryer among the portable ones which looks similar to the stationary devices. The main difference of this device is that it requires propane gas. It provides more flexibility than those portable car dryers, especially if you are planning to spend time in the forest, camping. A 16-ounce, this propane tank is enough for 60 hours of operation, while the device requires around three hours to make your boots totally dry. Thus, one tank gives you around 20 full drying cycles. Unfortunately, it has no timer and you have to check it periodically in order to save the fuel. 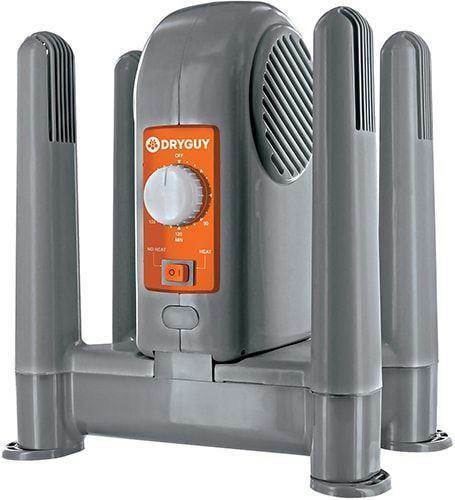 It's simply the best boot dryer as has no comparison amongst other portable models. People who are using enclosed shoes on a constant basis (military or police) usually suffer from an increased sweatiness of their feet, which is a disease called hyperhidrosis. If you are working in one of these fields, you simply need to buy a sterilizer for shoes. A usual dryer won’t be able to kill all bacteria and fungus; thus you need a special UV-lamp for your shoes. This lamp can be a great option. The main task of this device is to sterilize your shoes, which takes around 15-20 minutes. UV-light kills all germs and bacteria. This device also supports the ozonation feature that allows killing all organisms. It’s worth noting that your shoes need to be dry before using this device. We recommend you buy this device even if you don’t have any problems, because prevention is always a great choice. The Kendal Shoes Dryer features two long tubes to dry two pairs of shoes or two pairs of gloves at the same time. Your clothes will be ready in less than 30 minutes for you to wear them again shortly. As claimed by the manufacturer, the dry air will not only get your boots dry, but will also eliminate unpleasant odors and prevent the growth of bacteria and mold. There’s a special aroma active carbon that’s used to absorb odor and make your shoes smell better. The item comes with a wall-mount kit for convenience and an easy setup, has a timer, temperature settings, and more. The customers really appreciated the product for the ease of use, durability, and performance. This product is easy to recommend, considering it’s priced affordably for such a sophisticated electric appliance. I’m sure you would appreciate this dryer if you have kids because you know how kids are, right, always dirty and wet after playing outside (well, at least my kid is!). This shoe dryer is cheaper than the Kendal model, but it also dries up only a single pair of shoes. The temperature seems to be controlled and there’re timing settings available. The manufacturer, however, says that the drying will be complete overnight, so there’s no way you’ll get your shoes ready in an hour or so. It just as well eliminates odors and removes bacteria, can be easily folded for storage until needed. Overall, this product seems like a viable option but provided it dries boots as long as overnight, you might just as well use a radiator for that matter. This dryer looks pretty much the same as Briidea. It heats up from the underneath and then the heat slowly rises upwards down the tubes. It’s not making any noise while it’s working, but it takes a little while for the heat to take in. The shoes, however, are going to be ready as fast as with the Kendal, meaning in 30 minutes. This item is able to heat up only one pair of shoes, unlike Kendal though, maybe that’s why it’s a little cheaper too. What are the main benefits of a shoe dryer? Why would you buy a special device if you can just put a lot of screwed-up newspapers inside and place the shoes near a heating device? An electric dryer won’t damage shoes or boots. You can destroy the materials of your shoes by placing them next to a heating device. All dryers use hot or cold air flow, which can’t damage your precious leather shoes. It will protect your feet from fungus.By walking in slightly wet shoes, you can get fungus on your feet. A dryer will make your shoes totally clean and safe to use. It will dry your shoes incredibly fast. Sometimes even one hour is enough to remove all excessive humidity. DryGuy and MaxxDry are built and sold from the same address in Durham, NC. Not saying it is a bad thing, just thought it was interesting. I'm very happy with DryGuy DX Forced Air dryers. It performs all its functions for all 1000%. It costs a little more than a small dryer. The ability to dry several pairs of shoes at once, and boots is excellent!